I have already mentioned that you should pick one race and stick with it. 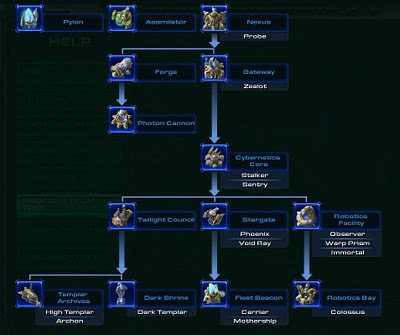 In StarCraft 2 you need to learn the units under your command, and that's difficult when trying to learn all three races at once. Once you decide on your racial preference it's time to start learning about your units. Their are two key things to learn about each unit: how to make that unit and what that unit is used for. 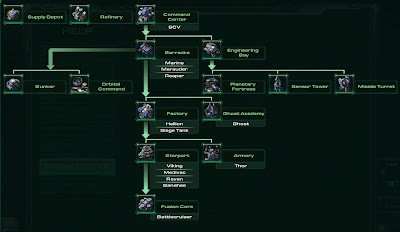 All of the tech trees and unit match-ups can be found from within a game by pressing the F12 button. All of my screenshots from this post came from the F12 menu. Use it to learn about your buildings and units. 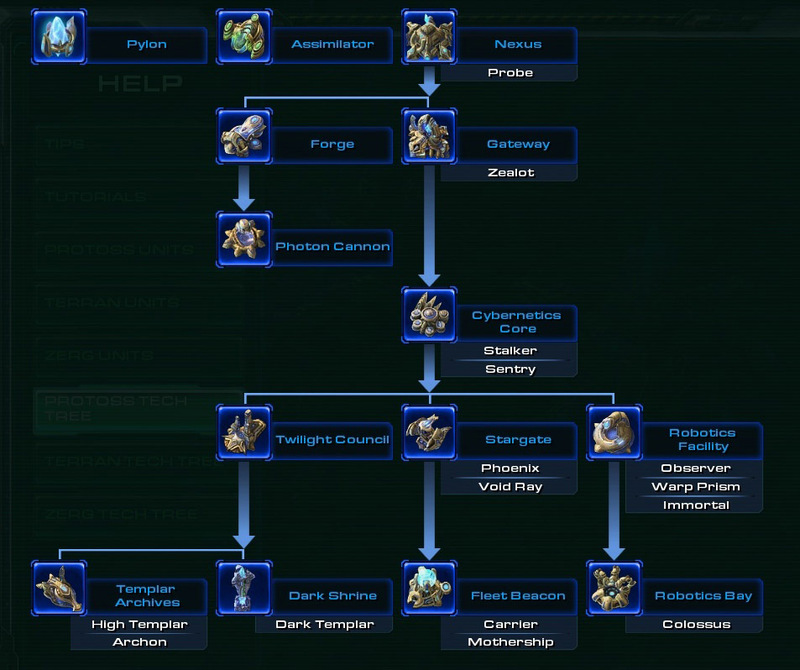 In StarCraft 2 it's fairly easy to figure out where to start producing the lowest level units. They're built from a basic structure that is needed to move up the technology tree - commonly called the tech tree. Protoss use Gateways, Zerg have Spawning Pools, and Terran build Barracks. 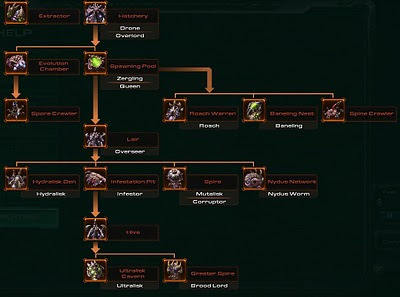 After the initial building you need to understand which structures to build to progress up the tech tree. 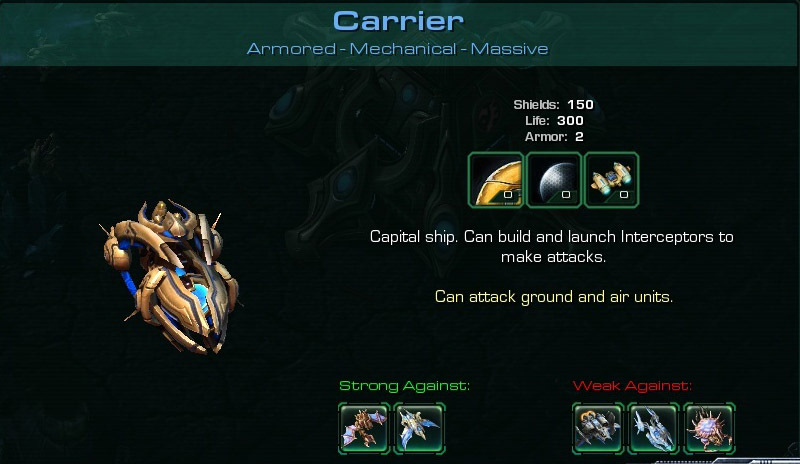 For example, I decide - as Protoss - to make some Carriers because I like the way they spit out tiny ships. After my Gateway I need to know to build a Cybernetics Core next. A Cybernetics Core will let me make higher tier buildings. These "advanced" buildings are the Twilight Council, Stargate, and Robotics Facility. In this case I need a Stargate to produce air units, but since Carriers are a higher tier than that I need another building to supplement the Stargate. Once I build the Stargate an option opens up to build a Fleet Beacon - which is exactly what I need. With the Fleet Beacon built I can now go back to the Stargate and create Carriers from there. This is simply one example. In your head you need to know how to do this for every unit that your race can make. Take some time to look at the tech tree for your race, the F12 button is your friend. 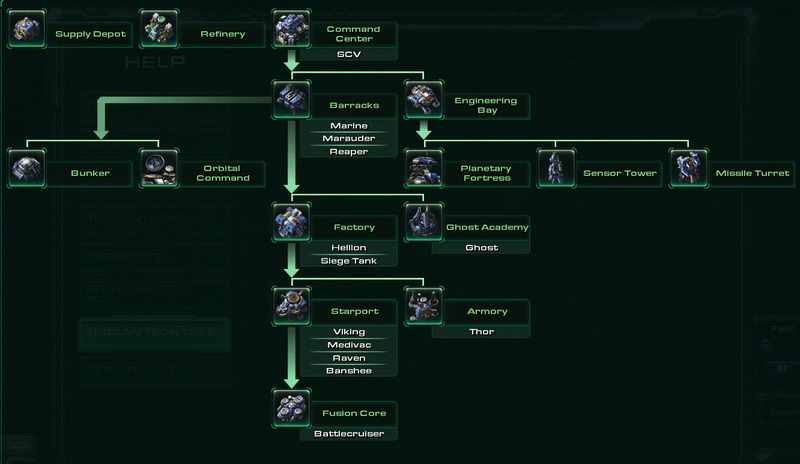 Since I'm your friend too; here are the Terran and Zerg tech trees for your viewing pleasure and handy reference. StarCraft 2 is essentially a modern day chess. Every unit is used for a particular purpose. No unit is the "best" unit in StarCraft 2. Every unit can be countered if you know what it's weak against. It makes sense then that every unit is strong against something. Knowing how to use the units you create is paramount to success. Let's again use the Carrier as an example. From looking at the Carrier statistics - F12 button - I can tell that they are strong against Mutalisks and Pheonixes but weak against Vikings, Void Rays, and Corruptors. I can also see that my Carrier will attack both ground and air units. This means if I discover that my opponent is in the process of making Mutalisks and I want to counter his build it's a good time to start making Carriers. These are the nuts and bolts that I need to successfully use a Carrier. Again, you need to know this information for all of your units. 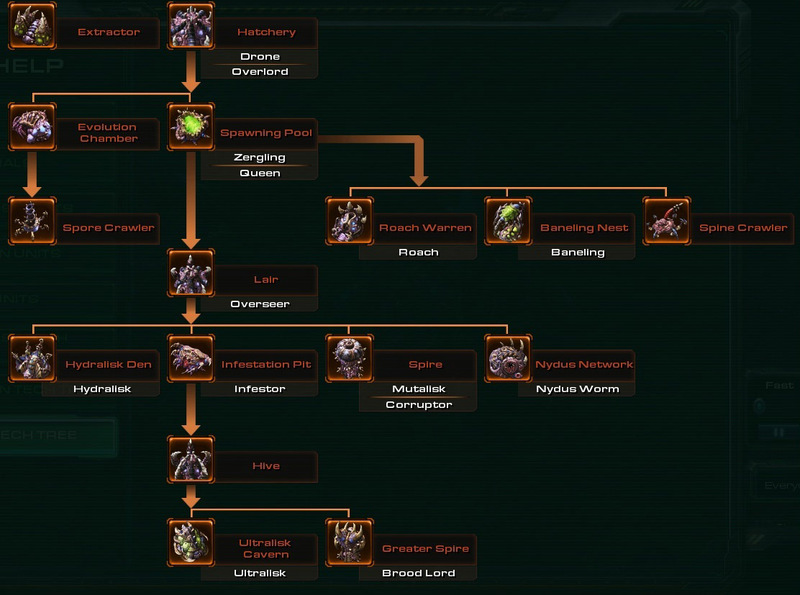 Learning how to effectively build and utilize your units will come with experience, but looking at the tech trees and unit statistics will help you learn about them faster.